The names Arya and Theon have reportedly taken a rise in the charts with parents taking inspiration from the wonderful 'A Song of Ice and Fire' book series, better known to TV audiences in its adaptation form, 'Game of Thrones'. While both of these names are lovely, the series is actually filled with excellent real-life potential. One of my favourites happens to be the sister of Arya, Sansa. 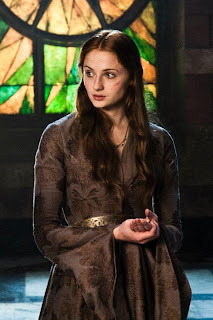 Sansa (pronounced SAHN-suh) is not a made-up name like I originally thought when I first read the books but instead is of Sanskrit origin and means 'praise, invocation, charm'. The name is also similar to the Latin name Sancia which means 'sacred'. George R.R. Martin drew a lot of inspiration for the names of his characters from history and it could very well be that he was inspired by a member of the infamous Borgia Family, Sancia of Naples, who was married to Gioffre Borgia (Sansa's first love interest in the fantasy series is named Joffrey, an alternative spelling to Gioffre). I also happen to find Sansa as an alternative to Sarah. While neither Sansa or Sancia has been popular in the charts, Sarah is currently #39 on the US Charts and #36 in Australia and despite the different meanings (Sarah means 'princess' but considering Sansa is a Princess of the North in the book series) I think that Sansa could make a perfectly good tribute to any Sarah namesake. And for anyone who likes the connotations derived from the name Apple, Sansa is a variety of the fruit. This happens to be one of my top names and I would very willingly use it on any child. It evokes sweetness and like its meaning, it has a ton of charm. With Arya on the rise, I would very much like to see the same happen to this name. The Gioffre/Joffrey connection is interesting too. It's also funny because GRRM foreshadowed Arya's crossdressing with her name. Arya is a MALE Persian name that means "faithful friend" (which she is, so long as you're mutual friends). Now there's a genius bonus. Also, Theon is an interesting case since his name means "untamed" in Ancient Greek. Considering that he's been in different situations where people have tried to "tame" him in one way or another (Ramsay being the most brutal example, but his father also counts in the way that he wanted Theon to act in a certain way even though he didn't earn his son's love after he abdicated all responsibility over him, even Starks could be said to have tried to "tame" Theon by trying to "civilize" him and not make him act like an Ironborn in a subconscious way). Since Theon's escaped Ramsay and forcefully tried to retain his identity, Theon shows his namesake in that he refused to let Ramsay "tame him" by refusing the Reek identity at the end. I really like these little genius bonuses that GRRM gives us. I have really started to like Sansa ever since reading these books! Wait a minute, I'm confused. What does she mean by "And for anyone who likes the connotations derived from the name Apple, Sansa is a variety of the fruit." How is this name derived from Apple? I love the name Apple, as well as what it stands for. And I also love Sansa. There are a variety of apples like Pink Lady or Grannysmith apples. One of these varieties are called Sansa apples. I probably worded it wrong in the post but there is a type of apple known as Sansa which is a cross between a Gala and Akane apple that was developed in Japan. Hopefully that clears that up. I can see how my sentence may be a bit confusing. I have a 4 month old daughter, and we named her Sansa. I love the name, and our daughter charms everyone who sees her. The only draw back is we're in Canada so the pronunciation is like Santa with an s instead of like salsa with an n, lol. We had a beautiful girl yesterday. She was born in the cold winter of Chicago and promptly brought a snow storm on the day she was born. She’s definitely charmed us all and this was the best name for her. we named her SANSA ! Queen of the North ! I have named my second daughter sansa as chosen by her uncle(mama) and I love this name. My first daughter is named sanvi the name of goddess lakshmi. Both sisters have names that sound good together.